Unusual Rigging & Engineering LLC has announced the appointment of Howard Dandy (pictured) as its new project manager and senior rigger for the EMEA region. Dandy, who assumes the role with immediate effect, has been with Unusual Rigging in the UK for two years and is qualified to NRC Level 2. His new responsibilities will incorporate all aspects of project management from site visit to completion across Unusual Rigging & Engineering’s busy and diverse project portfolio. Recent projects in the region have included the Mall of the Emirates, Ferrari World Abu Dhabi and Dubai Airshow. 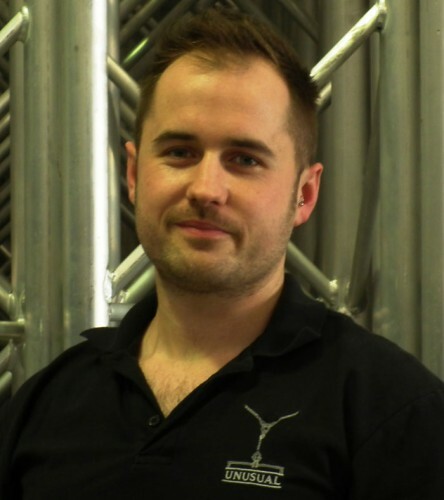 Dandy joined Unusual Rigging in the UK as an apprentice rigger in 2010, progressing rapidly to project and production rigger, before becoming head rigger in 2012. Past projects with the company have included the opening of St Pancras Renaissance Hotel, the Queen’s Diamond Jubilee and the London 2012 Olympics. Prior to joining Unusual, Dandy worked for Stage Co building stages for tours that included U2, Take That, Bryan Adams, the Rolling Stones and Iron Maiden, as well as Live Aid and the Brit Awards, while an earlier stint with Edwin Shirley Staging saw him tour with the likes of Madonna, Bon Jovi and Elton John. "I am very excited to be taking on the new role as project manager in Dubai," says Dandy. "I have had the opportunity to learn and grow in my two years at Unusual UK and find the chance to transport these skills to a different market a very inviting challenge." Alan Thomson, managing partner of Unusual Rigging & Engineering, said: "As the company continues to grow, Howard’s experience on such major projects as the London 2012 Olympics and the Queen’s Diamond Jubilee will serve us well." Unusual Rigging and Engineering LLC can be contacted at PO Box 283586, Dubai,UAE; telephone +971 (0)4 885 9009, fax +971 (0)4 813 5145; or email at dubai@unusualrigging.com.